After visiting Monkland Cheese Dairy and Leominster in the morning, we went to see Flounder's Folly in the evening. We had seen the tower standing on top of the hill a few times on our trips to various nearby places on the previous days of our holiday, and it looked like an interesting place to see. 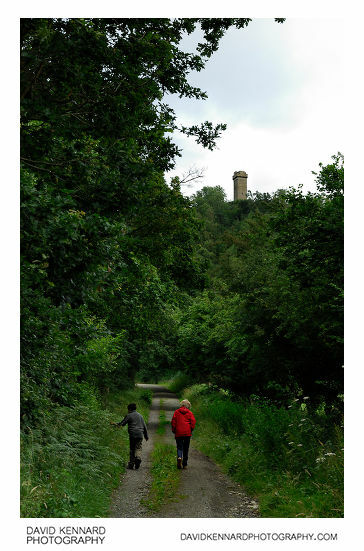 To get to the 'car park' (fits approx one car) at the bottom of Callow Hill (which Flounders' Folly is built on), we had to go down quite a long distance of twisty turny single track road. After parking, we then had to walk along the track up Callow Hill to get to the Folly. The hill is quite steep, so the track zig-zags across the hill. 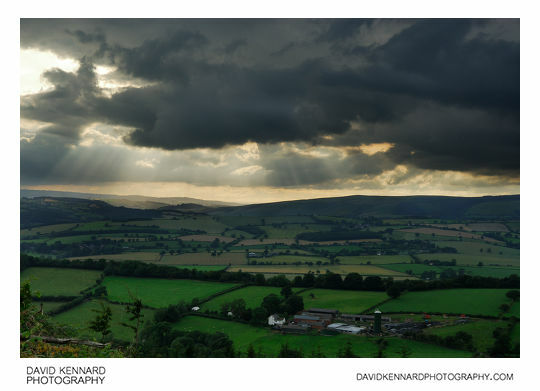 This photo is taken not far from where we parked, you can see Flounders' Folly on top of Callow Hill ahead. Unfortunately the camera metered for the foliage taking up most of the image space, resulting in blown out clouds, even on the EV-1 image (remember, I bracket all my shots). I did try dialing in some negative exposure compensation and taking the shot(s) again, but the meter decided that the second batch of shots needed to be 1 stop brighter than the first lot (I was shooting in Aperture Priority Mode), so the resultant images were shot at exactly the same settings at the first lot. 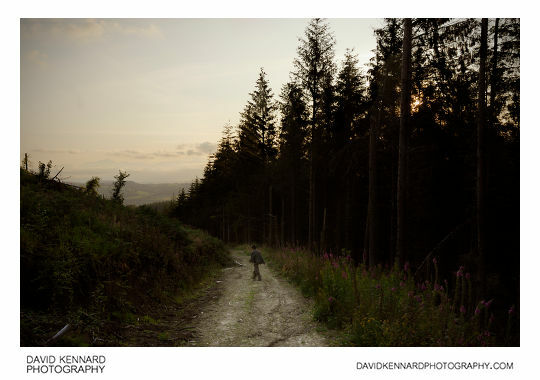 And by the time I saw this, Clare and Ben had walked too far ahead for a similar photo. It took a while to walk up to the top, but we were rewarded with quite a nice view from the top. 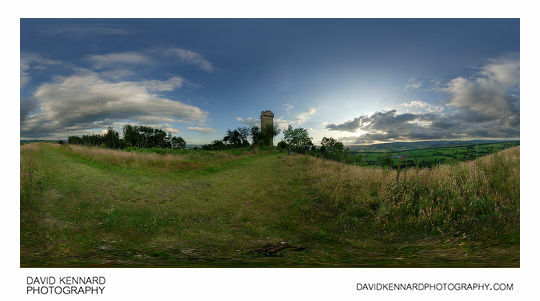 I lugged my tripod and pano head up with me, so I took a 360° from near Flounders' Folly. Compared to processing the handheld panos I'd taken at some of the other places we'd visited, processing this pano was a nice change, with no messy (and extremely time consuming) copy-paste-warping needing to be done to get the images to align. Although I've seen some nice photos of Flounders' Folly on other websites, e.g. on the Wikipedia article and this website about Follies, the area around the tower seemed to be surrounded by bushes (at least as far as I can remember), and so I only got a close shot using the fisheye. There wasn't much to see at the folly really, it's just a tower with a door in it. The Flounders' Folly Trust do have open days where you can go inside the tower, but obviously you need to be there when it is open (dates and times are available on the Flounders' Folly Trust's website). 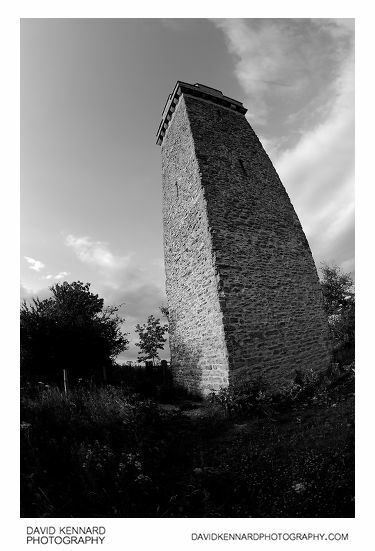 So after seeing Flounders' Folly, we walked back down the hill, then went back to the holiday cottage for the night.